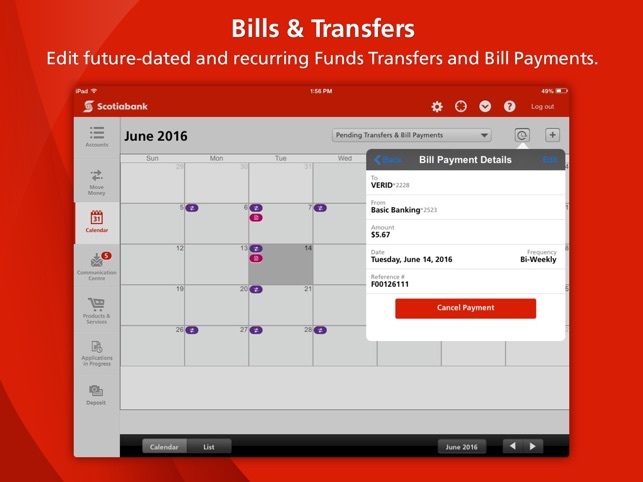 The Scotiabank Mobile Banking app makes it easy to manage your accounts, make payments, transfer funds, and more, all from your iPad. 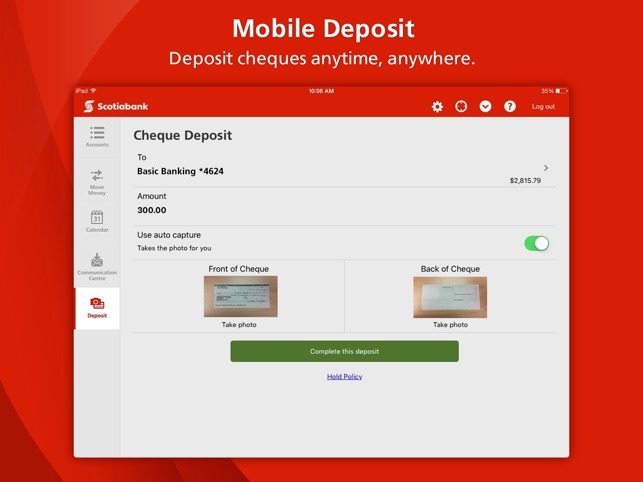 • Deposit CAD and USD cheques anytime, anywhere using Mobile Deposit. 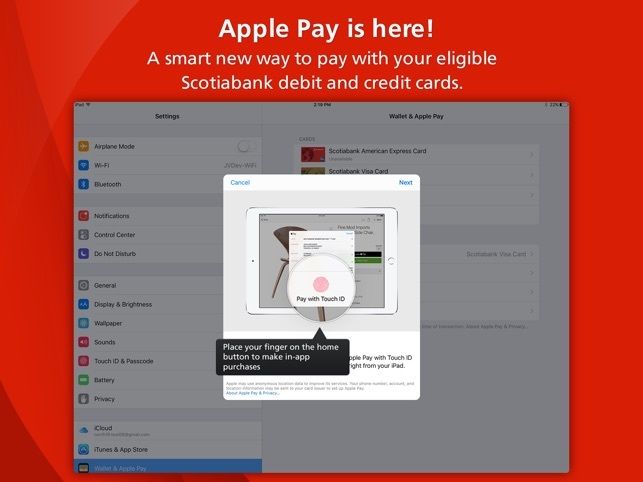 • We now support Apple Pay. • Set up Travel Reminders, and we’ll automatically advise you to create a travel notification for your credit cards when you go abroad. • Send Interac e-Transfers in Canada to your email contacts, or elsewhere in the world with Western Union Money Transfers. • Apply for a new credit card or request a credit limit increase via Products & Services. 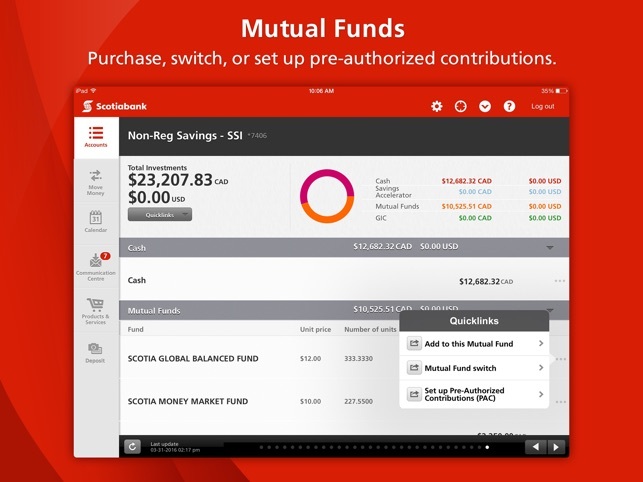 • Find a Scotiabank branch, ABM or advisor with the Locator. If you’re traveling, use it to find partner ABMs from the Global ATM Alliance, and save on fees. 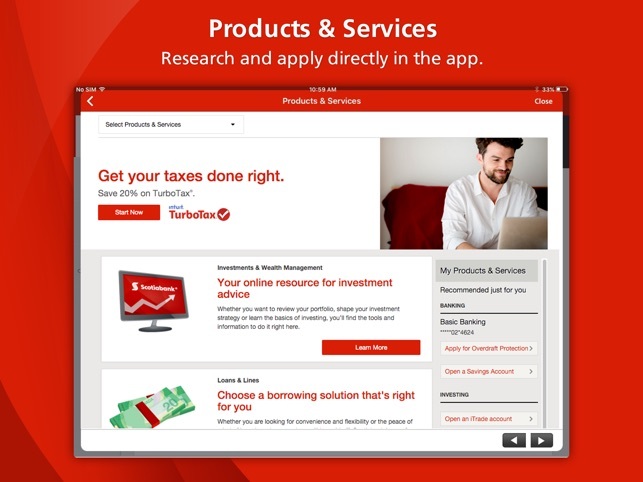 Contact us at 1-800-472-6842 (Canada/USA) or +14162883899 if you need support, or help uninstalling our app. Add Touch ID and the rating will be 5 star. App does not work well! I’ve been using this app for about 6 years. Now it has a LOT of problems,. Cannot accept etransfers, it completely shuts down. Today I had to use safari again. It’s been a long time since I’ve had as bad an experience with an app as this one. Difficulty resetting password, difficulty calling in to do it over the phone (which we shouldn’t have to do in 2019), and then once the password was reset, the app won’t work anyway. It hangs right after setting up my security questions and when I click “continue to account”.... nothing. Terrible, terrible, terrible.